Step 1: Wrap tortillas in foil and place in oven heated to 350 degrees F (175 degrees C). Bake for 15 minutes or until heated through. Step 2: Heat oil in a 10-inch skillet over medium heat. Place onion, bell pepper, garlic and jalapenos in skillet, cook for 2 minutes stirring occasionally. Pour beans into skillet, cook 3 minutes stirring. Step 3: Cut cream cheese into cubes and add to skillet with salt. Cook for 2 minutes stirring occasionally. Stir cilantro into mixture. Step 4: Spoon mixture evenly down center of warmed tortilla and roll tortillas up. Serve immediately. 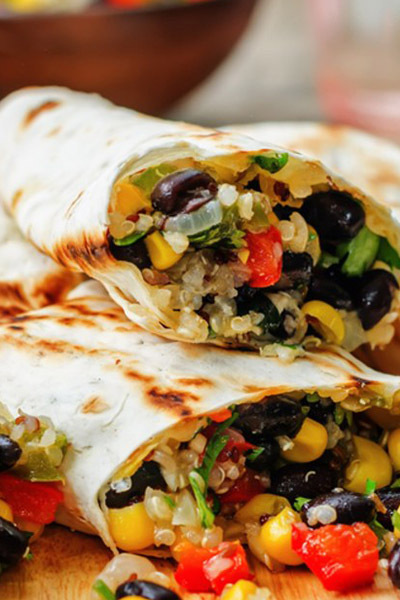 Enjoy these easy black bean burritos from AllRecipes!